The British culture critic and activist Brian Holmes claims that the imprint of artistic experimentation on social protest movements is undeniable. He examines the notion of process as that which exper­imental art and ­­ acti­vism have in common. Holmes analyses the exodus, mass defection, as a means of escaping the immobilizing transparency of the mediated democracies, as a way to resist politics-as-usual. 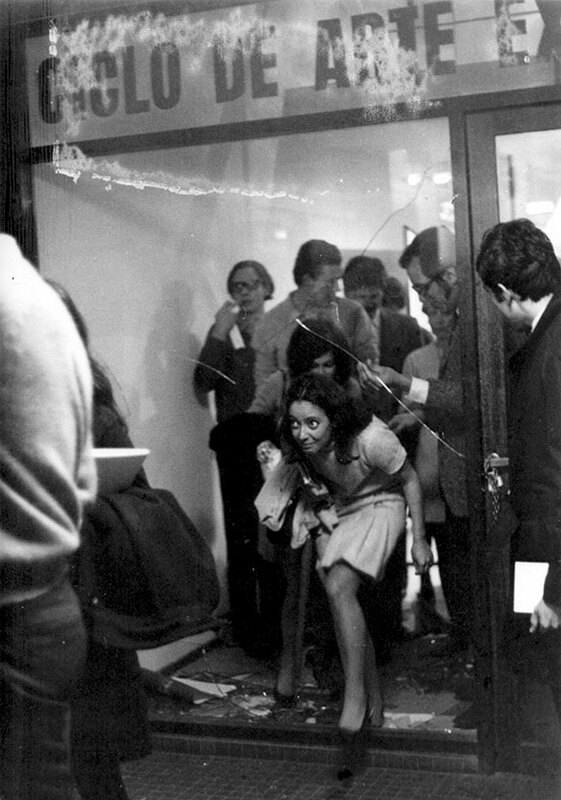 Graciela Carnevale, El Encierro (the Lock-up Action), part of El Ciclo de Arte Experimental (The Art Experimental Cicle), Rosario, October 1968. Photo Carlos Militello. Graciela Carnevale, Tucumán Arde, graffiti advertisement for an exhibition in the CGT, Rosario 1968. What is it that separates the left from the right?... Fundamentally, it is nothing but a processual calling, a processual passion. In October of 1968, in Rosario, Argentina, the artist Graciela Carnevale invited visitors to what would be the final opening of a ‘Cycle of Experimental Art’ held in a storefront space in the city. Her contribution to the series consisted in luring the public inside, then slipping out to lock the door and enclose the crowd within the gallery. The visitors became the material of a social artwork. The question was: How would they react to this imprisonment? Who would finally shatter the glass to release the captives from the trap? ‘Through an act of aggression, the work tends to provoke the spectator to a heightened consciousness of the power whereby violence is exerted in the everyday world’, wrote the artist. ‘On a daily basis we passively submit, through fear, connivance and complicity, to all the degrees of violence, from the most subtle and degrading violence that coerces our thinking via communications media broadcasting false contents provid­ed by their owners, to the most provocative and scandalous violence exerted on a student’s life.’2 In the event, the public submitted. After an hour, the blow that finally shattered the glass came from outside. A photograph shows a woman crouching down to exit through a jagged hole in the window. 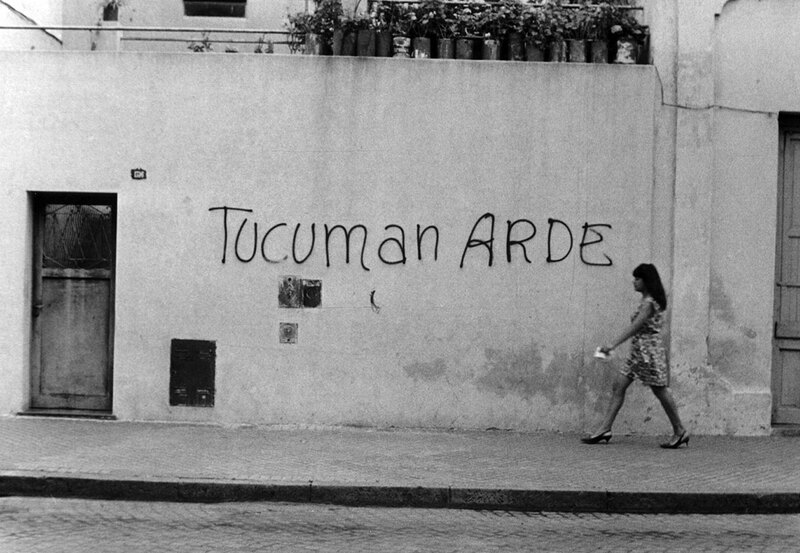 At the same time, Graciela Carnevale was also part of the project known as Tucumán Arde, or ‘Tucumán is Burning’ – an experimental process of information analysis, multimedia reportage and artistic display, involving some thirty artists in an attempt to expose the conditions of exploitation, expropriation and impoverishment in an Argentinean province. The participants, who had drawn their conclusions from the most advanced theoretical positions and ­technical experiments of the time, chose to break with the existing institutions in the hope of infiltrating the national information system and contributing directly to the political struggle against the Onganía dictatorship. Tucumán Arde is increasingly recognized as a genealo­gical departure point for the kinds of media activism practiced today.3 But can we not also read Carnevale’s enclosure piece as an allegory of the way that social classes are transformed under conditions of urgency? In the late 1990s, the politically involved sectors of the overdevel­­oped countries – the NGOs, the ­charities, the unionists, the commu­- nists and ­ecologists – were the people inside the glass bubble of consensus, or ‘civil-society dialogue.’ It was the direct actionists who shattered the window. We know that the cycle of massive demonstrations that began in the years 1999–2001 was no miracle. The impetus had come from the South, primarily from social movements in Latin America and India. The global justice campaigns, inspired by South African efforts to force debt cancellation, had built a tremendous following. Critique of neoliber­alism had become a national issue in both France and Canada. The labour movements of the overdeveloped countries were ripe for radicalization. And the Zapatistas offered a new model of political confrontation, combining powerful symbolic actions with national and international networks of support. But political forces must be set into motion, passions have to catch flame. In the cities of Western Europe and North America, where the postmodern waning of affect appeared to be complete, it was the urban cultures of resistance that struck the match. ‘Reclaim the Streets’ in Great Britain, the Tute Bianche (‘White Overalls’) in Italy, the Direct Action Network of the Pacific Northwest United States – these were the catalysts that transformed a diffuse aspiration of isolated civil-society groups into a movement, able to take to the streets and reach beyond the specific demands of each dissenting group. A political generation is forged, not by determinants of age, but by choices of involvement and experiences of confrontation. How are such choices made? The invitation to illegal protest that sparked the current cycle of anticapitalist mobilizations aimed to draw out the participation of social categories, particularly youth, who could no longer be lured into involvement by identity ­issues, parties or unions. But it also sought to bring more traditional formations into heightened conflict. The success of the Direct Action Network in Seattle, at the WTO meeting in November 1999, was to use civil-disobedience techniques to immobilize ­traffic in a key sector of the city, focus­ing police repression and in this way creating a magnetic attractor for union members exiting from their consensually managed events – but also for local inhabitants, ecologists, Third World delegations, anarchists and many others. Through that intervention a five-day urban uprising was unleashed. In a less disciplined yet equally potent way, the ‘Reclaim the Streets’ carnivals offered a tantalizing cocktail of transgressive pleasure, informed political protest and direct confrontation, which radicalized the participants by exposing the struc­tural violence of contemporary social relations. But the Tute Bianche of Italy developed the most explicit strategy. The white overall, which could be ­donned by anyone, signified the per­meability of a movement that was not ideological in the disciplinary sense. The use of quite ridiculous-looking protective padding created a theatrics of humour and self-derision, while allow­ing police brutality to be captured on video as a kind of comic spectacle. Most importantly, the duration of this movement was limited in advance by the prediction of its self-dissolution into all the colours. The release from a paralyzing consensus became constitutive of the movement. It would be misleading to claim that the direct actionists played the role of a vanguard artist, leading a naive public into an experiential trap where every participant would be forced to draw fresh conclusions. The self-transformation of society is more complicated, more multiple, than Carnevale’s enclosure piece can suggest. Yet the imprint of artistic experimentation on the current political generation is undeniable. The most obvious contribution of the visual arts to the anticapitalist movements is the merger of community-oriented video with the distribution system offered by Internet, giving rise to innumerable non-normalized media projects that combine documentary information and expressive politics, in the lineage of Tucumán Arde. These proj­ects carry out a specular combat with broadcast TV – that is, with the spectacle society – and in that way, they at least partially fulfil the political aspirations of the early video makers. Another, more subtle thread is the proliferation of mail art, first through ‘zine culture and desktop publishing, then through the net, culminating in the mid-1990s in the widespread circulation of subversive texts and media pranks under multiple names like Monty Cantsin or Luther Blissett. Multiple names bring the refusal of copyright and intellectual property to the very centre of ego-dominated subjectivity, in an attempt to dissolve the proprietary function of the signature which has always served as the barrier between contemplative, individualistic art and collective, interactive forms of expression. Yet another artistic contribution to the movements is performance culture, with its emphasis on the embodiment of the political, played out in its inseparability from the sexual, ritual, generational, ethnic, and psychodramatic dimensions of human experience. One could be tempted to conceive the entire dispositif of the carnivalesque demonstration as an extension of performance to the streets. But if we stopped there we would miss the deepest commonality between experimental art and activism. This is the notion of process, as a value in and of itself. In the now-canonical ‘anti-form’ definitions of the 1960s, process designates the temporal dimension of materials, their transformation in time, as initiated or continuously effected by the activity of the artist. But there is another definition, whose roots lie in the chance philosophy of John Cage, in the relation of prop and performance sought by Fluxus, in the interplay of score and interpretation developed in concrete poetry and vanguard dance, in the orchestrated chaos of the happenings, the improvisational work of the Living Theater or the insurgency of Provo and Situationist interventions. In these approaches, process can be defined as the generative matrix constituted by the meeting of catalytic artefacts, more-or-less conscious group interactions, and the dimension of singular chance inherent to the event. This artistic understanding of the way that ‘social material’ can proactively transform itself over time was enriched by the movements of anti-psychiatry and schizoanalysis, which extended the domain of what could be accepted as self-expression, and attempted to reshape institutional structures to accommodate this multiplication of subjective forms. The micropolitics of a host of liberation movements of the 1970s, including the women’s movements in particular, but also the local constellations of Italian Autonomia, made group processes of self-understanding and decision-making into one of the ways that adherence to a political project is developed and sustained over time. The difference of the last ten or fifteen years is that the proliferation of expressive practices in everyday life – inseparable from the rise of intellectual and affective labour4 – has brought the specifically artistic definition of social process back to the forefront, not within the art world but in the more open and uncontrollable space of the urban event. The fundamental relation between post-vanguard art and contemporary social movements is here, in this resurgence of expressive and interactive process which has helped forge a political generation. What it gives us to understand is that an entire current of experimentalism has migrated outside the realm of art as defined by the signature-work. But this realization is only the departure point for a series of questions concerning the political postures that have developed as a necessary exodus from the immobilizing transparency of the mediated democracies. The questions are these: Why was the mix of carnival and direct action so important to the protagonism of civil society? How has the situation changed since September 11? What will happen to the new political generation that emerged just before the authoritarian turn? And what roles can artists play in that gen­eration’s development? Similar ideas developed in South America, in the face of the dictator­ships. The aim was to open up a myriad of divergent and ultimately uncontrol­lable micropolitical spaces, in order to succeed where the guerrilla struggles had failed.8 This conception of divergent spaces remains an important legacy for anti-systemic movements, as witnessed by the Zapatista autonomous zones, the Social Forums, John Holloway’s call to change the world without taking power, or Paolo Virno’s notion of a non-state public sphere.9 But there has been a critical change since the 1980s. No one today can ignore the deeply ambiguous role that civil society would play after 1989 – especially since Michnik, Havel and Konrad have all supported the invasion of Iraq.10 The more recent attempts to intervene on social material have all had to respond to the bewildering metamorphosis of civil society after the collapse of the Soviet Union. The integration of a diluted concept of civil society to the reality of capitalist globalization was a consequence of the ideological vacuum left by 1989. In the absence of any coordinated oppositional force, every critique could be consid­ered at worst harmless, and at best, profitable. The exploitation of humanitarian NGOs by the neoliberal state is there to prove it – along with the corporate patronage of art. Yet the 1990s were also a time of opening. Air transportation, global communications and international coordination were now accessible even to informal groups. The structures of governance became more transnational but more transparent too, permeable to the public, permeated by the media, constantly overseen by innumerable observers. The paradox of civil society in the years of Clinton, Blair, Jospin and Schroeder was to sit on all kinds of ­official panels, to be aired on all kinds of channels and to be allowed to debate about everything, except the basic ­values that orient the post-’89 world-system. By the end of Clinton’s imperial mandate, the need for direct action became obvious – at least to those on the fringes. Because they did not claim to be civil anymore, deliberate gestures of disobedience could break the distort­ing mirror and reclaim the density and opacity of an oppositional position. Only this kind of confrontation could make activists from the South take the Northern protests seriously. But the ­carnivalesque dimension, the artistic treatment of information and the experimentation with social process are not just window dressing for a protestor’s brick. These are the ways that participants have found to reinvent the anti-political space of everyday experience, despite full-spectrum attempts at commercial, cultural, governmental and ideological mediation. It’s often said that September 11 put an end to the effectiveness of direct ac­tion protests, by delegitimating anything that could be assimilated to terrorism and authorizing massive deployment of the police. That’s true, and the strategy had already been sketched out in Genoa. But the consequences of September 11 on the US government have had the long-term effect of demonstrating that the fusion of the state with a corporate oligarchy can produce a repressive apparatus that stretches its electronic fingers into every aspect of daily life. We are witnessing the onset of a social pathology, comparable in scale if not in nature to the Cold War. And only idealists could believe that the European bloc is not producing its own variations on this pathology, for instance in the treatment of immigrant workers and the national­ist rhetoric surrounding the presence of so-called foreigners, or in the establishment of detainment camps inside and outside the EU borders.12 But to oppose the security panic and the reality of institutional racism that underlies it would mean refusing the false transparencies, escaping the co-optation machinery of parliamentary democracy itself. This is why in the very moment of their rise to visibility and to more complex forms of organization, dissenting social movements have begun to experiment once again with new forms of anti-politics, marked by the pragmatics of defection and exit, but also by the more intangible, almost mythical theme of exodus. The satire of consensus was perfect – and so was the call for massive direct action that would paralyze entire cities. The banner in the gateway expressed the widespread desire for something more effective than the global antiwar demonstrations of February 15, 2003, which were in fact proposed at the ESF meeting in Florence. Along with this idea of mass defection from the milita­rized societies, it asserted the possibility of a wholly other war: a subversion that could dissolve normalized behaviours and established hierarchies.13 The networked activists had not forgotten that Deleuze and Guattari conceived their nomadic war machine as a potential of expressive and epistemological variance that could operate within every institution, and even at the heart of the military-industrial complexes. They had not forgotten, because the development of the Internet over more than thirty years has proved this kind of subversion to be a practical reality. Such struggles neces­sarily take place within the capture-devices that seek to neutralize them: thus the entry of the activists into the castle, as a way to pursue the exit from politics-as-usual that had launched the entire social forum movement in the first place. Without a constant resurgence of the radicalizing process, grassroots mobilization can be halted by the very organizations and figureheads it needs in order to expand its field of trans­formation. But this is what has been learned since the early demands for the representation of civil society. The des­tinies of the current political generation depend crucially on maintaining the possibilities both of large-scale organ­ized confrontation, and of direct, micropolitical participation in the processes of self-government. These understandings appear clearly in the new mobilizations around precar­ious labour, articulated among others by the French part-time cinema and ­theatre workers and the EuroMayday paraders in Milan and Barcelona.14 These confronta­tional movements, which make a great use of street performance and artistic invention but also of very specific juridical and sociological knowledge, can be seen as attempts to infiltrate, destabilize and reconfigure the social state. Not only is a new kind of labour to be considered – part-time or interim workers – but also a new set of claims, which mix wage and social insur­ance issues with the demand for more free time and better opportunities to use it. The treatment of casual labour becomes a question of human ecology. Thus what is ostensibly a workers’ movement builds constitutive links to struggles over unemployment, education, environmental conditions, real-estate speculation and the commodifi­cation of culture. The massive presence of migrants in the circuits of precarious labour brings in concrete North-South issues of unequal exchange as well, and thereby lends these campaigns at least the potential to act with the full political composition that first appeared in Seattle and Genoa. In this way, unioniz­ing strategies can remain part of a ­larger struggle, which requires a multiperspectival awareness of its protagonists. The goal is to transform the state, but without becoming it – that is, ­without being subjected by its market imperatives and bureaucratic categories. Only in this way can the horizons of social change remain open enough to embrace the world. Artists and media activists participate directly in these movements and at the same time symbolize them, by condens­ing their experience of the radicalizing process into expressive works. The distribution of these works, through alternative circuits and then gradually through broader institutional formats, is a way to give complexity and consistency to the affects of rebellion and refusal. But the familiar limits have not vanished. The basic functions of selection and ­framing, editing and repurposing, are performed in perfect transparency by the gallery-magazine-museum system. As the demand for an activist aesthetic rises, the selection will almost inevitably come to focus on dramatized images of insurgency, associated with a truncated genealogy of theoretical concepts from the late 1960s and early ’70s. In other words, the presentations will slice out a few visual and conceptual elements from a longer, broader and more ­complex history, leaving the viewer untroubled by any kind of processual passion. A new institutional critique might then arise, denouncing the failure of museums to adequately inform the public. But in reality, it is the inherent failure of representation, both in the visual and the political sense, that contin­ually leads activist-artists to abandon their work and their familiar skills, and to dissolve once again into the intersubjective processes of society’s self-transformation. This moment of dissolution is where one could locate exodus, not as a ­concept, but as a power or a myth of resistance. On the one hand, exodus is a pragmatic response to the society of control, in which any widespread poli­t­ical opposition becomes an object of exacting analysis for those who can afford to invest major resources in the identification, segmentation and manip­ulation of what we naively call the public. In the face of these strategies, exodus is a power of wilful metamorphosis: the capacity for a movement to appear, to intervene and to disappear again, before changing names and recommencing the same struggle in a different way. And this too is a process that artists can symbolize, by perform­ing the self-overcoming of art once again – at the risk of dissolving their proper names, their trademarks and their careers. But the very statement of this tactical necessity of disappearance raises a deep anxiety, which must be familiar to all old revolutionaries, about the possible continuity of resistant ­culture, or the constitution over time of something like an anti-systemic movement. In this regard, exodus seems to designate an existential reserve, that psychic space where fragments of artistic, poetic and musical refrains are inseparable from the wellsprings of ­action, but expressible only as a kind of myth.15 To touch this intangible space is the ulti­mate intervention on social material – something no individual can do, because it is only achieved through a collective experience, by a multiplicity that has no authority, no signature. Exodus is an expression of process politics. It points beyond the distorting mediations and structural inequalities of capitalism toward a strange sort of promised land for the profane, which is the immediacy of the everyday, the direct experience of cooperation with others. The carnival that sometimes ­breaks out in the midst of concerted political action is a way to celebrate the occasional reality of this powerful and persistent myth. 1. F. Guattari, ‘The Left as a Processual Passion,’ in G. Genosko (ed. ), The Guattari Reader, Blackwell, London 1996, p. 260. 2. G. Carnevale, catalogue text, ‘Ciclo de Arte Experi­mental,’ in Ana Longoni and Mariano Mestman, Del Di Tella a ‘Tucumán Arde’, El Cielo Por Asalto, Buenos Aires 2000, p. 122. 3. See M. Carmen Ramírez, ‘Thriving on Adversity: Conceptualism in Latin America, 1960–1980,’ in Global Conceptualism: Points of Origin, 1950s–1980s, catalogue, Queens Museum of Art, 1999, pp. 66–67; as well as M.T. Gramuglio and N. Rosa, ‘Tucumán Burns,’ in Conceptual Art: A Critical Anthology, A. Alberro and B. Stimson (eds. ), MIT Press, Cambridge, Massachusetts 1999), pp. 76–79. 4. For the relation between labour and expressive politics, see Paolo Virno, ‘Virtuosity and Revolution: the Political Theory of Exodus,’ in M. Hardt and P. Virno (eds. ), Radical Thought in Italy, University of Minnesota Press, Minneapolis 1996, available at: www.makeworlds.org. 5. G. Konrad, Anti-Politics: An Essay, Harcourt, Brace, Jovanovich, New York 1984, p. 231. 6. V. Benda, quoted in Mary Kaldor, Global Civil Society, Polity, London 2003, p. 56. 7. G. Konrad, Anti-Politics: An Essay, op. cit., p. 211. 8. For the Brazilian situation in the early 1980s, see Félix Guattari and Suely Rolnik, Cartography of Desire: Schizoanalysis in Brazil (forthcoming from MIT / Semiotexte, 2005). 9. J. Holloway, Change the World Without Taking Power, Pluto Press, Londen 2002; P. Virno, A Grammar of the Multitude. For an Analysis of Contemporary Forms of Life, Semiotext(e), New York 2004. Also see note 4. 10. Michnik justified himself and his two peers in an article entitled ‘We, the Traitors,’ published in his own newspaper, Gazeta Wyborzca, Warsaw, 28 March 2003, available in English at: www.worldpress.org. 11. V. Havel, ‘The Power of the Powerless,’ in J. Keane (ed. ), The Power of the Powerless, Hutchinson, London 1985, p. 91. 12. See I. Saint-Saëns, ‘Des camps en Europe aux camps de l’Europe,’ in Multitudes 19, Paris, December 2004. 13. For the subversive ­philosophy of this slogan, see the Spanish-language publication ‘[sic]’: www.sindominio.net. 14. See www.cip-idf.org and www.euromayday.org. 15. See F. Guattari, Chaosmosis: An ethico-aesthetic paradigm, Indiana University Press, Bloomington 1995, esp. pp. 19–20, 60–61.